This article is about the summon stone. For the non-party character, see Eren (NPC). 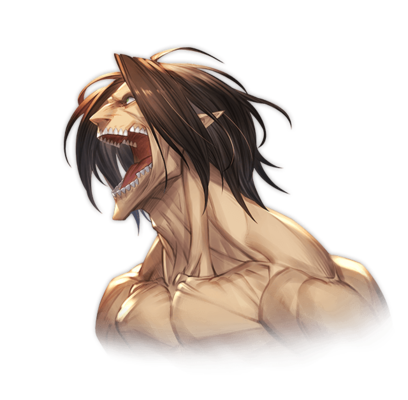 Eren Yeager is able to attain this Titan form when his purpose is true and he inflicts pain upon his body such as biting down on his finger. His fateful transformation changed the view that Titans are mere monsters who only eat humans. Will his power bring hope, or will it bring fear to the people within the wall? Aura - Destroy Them All! Massive fire DMG to all foes / Medium hit to DEF / Small boost to all allies' ATK / 30% boost to Mikasa and Levi's charge bars 9T9 turn cooldown. This page was last modified on 26 March 2019, at 09:10.